Some users are finding that updating to iOS 7 seems to have reduced the battery life of their iPhone, iPad, and iPod touch devices. Battery issues are often reported with major iOS updates, but this time around the culprits of newfound battery drain are easier to identify, because much of it relates directly to some new features and new control mechanisms built into the new iOS release. Fortunately, this makes for easy identification and easy remedies, so if you’re encountering any issues with battery life not living up to your expectations, you can probably resolve the draining issues quickly with a few settings adjustments. 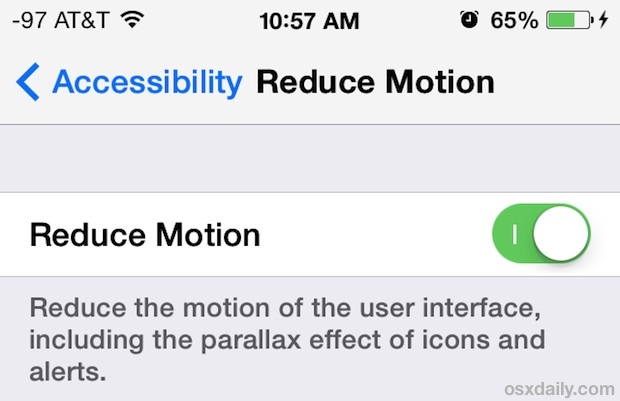 Note: these motion features of iOS 7 are likely to have much less of an impact on battery life with the iPhone 5S and other future devices that have the separate M7 motion chip. In the meantime though, motion sensing is done by the primary CPU, thus potentially impacting battery life. 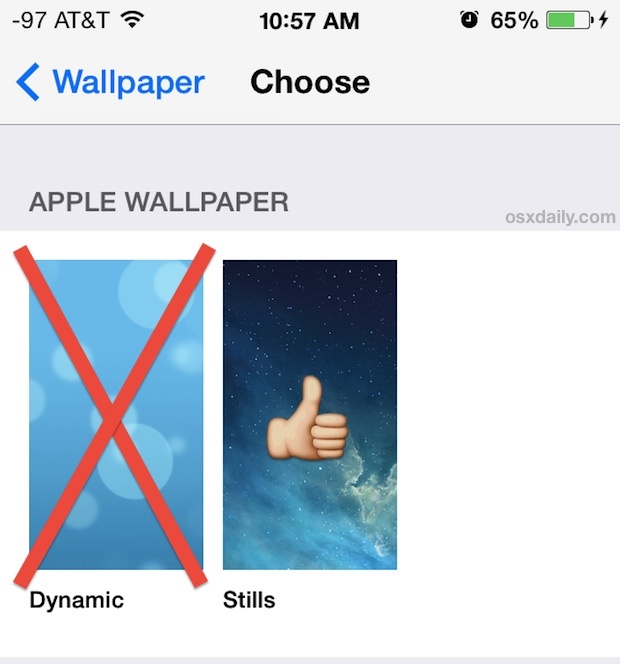 A bit off topic, but the overall appearance of iOS 7 depends a lot on your wallpaper choice, so keep that in mind when setting wallpapers too. 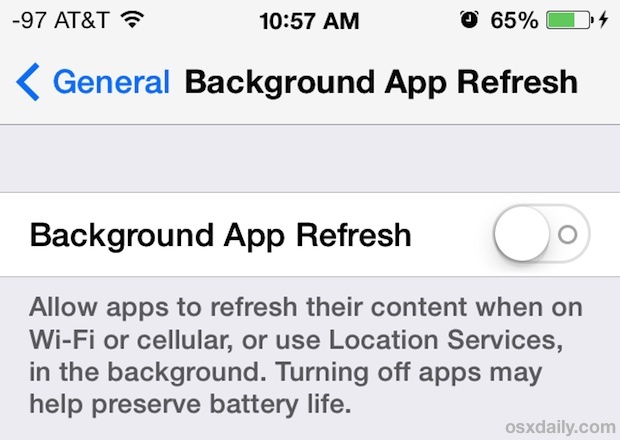 Outside of saving your battery life, turning off this feature won’t be noticed by most people since it returns app behavior to how it was in prior versions of iOS, meaning apps in the background are basically halted until in the foreground again. Having your apps automatically update sure is convenient, but it also causes activity on your iPhone, iPad, and iPod touch when it’s not in use, and that means it’ll drain your battery. 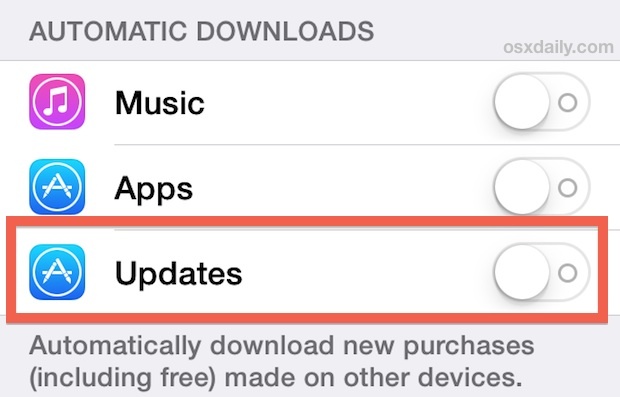 Turn off the other Automatic Downloads in there too if you don’t find them useful. If you like this feature more than you like a slightly longer battery, go ahead and leave it on. But you’ve probably commuted to work a few hundred billion times by now, do you really need an estimate for something you already know? Your call. Keeping your screen nice and bright may look great, but it also uses a lot of power. This is nothing new to iOS 7, but it’s one of the single most effective tricks at prolonging battery life for just about any battery operated device, and your iPhone, iPad, and iPod touch is no different. 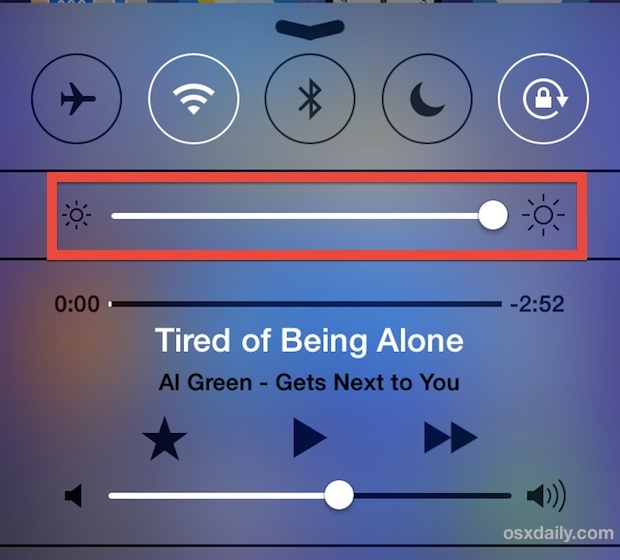 Fortunately, adjusting brightness is much easier now thanks to Control Center. Swipe up from the very bottom of the screen and so keep it low to preserve your battery as much as possible. Setting it around 1/4 of the way or less will have the best results. Having it at or near 100% will result in a very quickly draining battery. 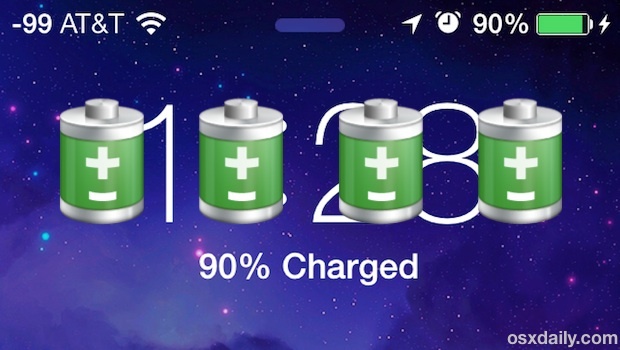 None of these more general tips are unique to iOS 7, but they can help to extend the battery life of just about anything, even if you’re still running iOS 1.0 on an original iPhone. The only way to save your iphone’s battery is to turn off all smart features or, simply, your phone. Tips always teach you turn off everything. Thankyou for your info. My battery was also draining super fast. I followed your suggestions and didn’t know about turning off the aps.-this is my first smart phone and just didn’t know to do that. I was amazed to see them all on the screen as I was swiping them. Hope that does the trick. Do you have to download the updates and what happens if you don’t? Updates do not have to be downloaded. An example of an update I haven’t downloaded is iOS7! Things run so awesomely with iOS6, and none of the new features are must-have’s for me. For each new update offered, right there in the AppStore you can read about the benefits of the new updates and best of all you can read reviews by people who have updated. Note the dates of the reviews, the most recent should be first, meaning they cover the current update. I wait to update apps until I see evidence that improvements outweigh new bugs created by the update! Once you have updated the os to 7.0 is there for good? Cause I wish I never would have upgraded/updated…can u go back to say os6??? after ds trouble shooting also unable to get 1% satisfactory result. I turned off all the buttons that were suggested. Still losing power from 100% to 51% in less than 2 hours. Will likely have to reset to factory defaults by sending in to Apple Store. Is reset to factory defaults something I can do on my own? If we have to turn off all these smart features then why use a tab at all! Always apple has expected users to adjust with their way of functioning:( my battery is draining way too fast. This works for my iPad Mini! Did not fix both my iPad 2 and iPhone 4. Both have the same issue and it’s intermittent. My autolock is already set to 1 min and passcode lock to 5. I have tried factory reset, restores and shutting off all the background features to no avail.The guy in the Apple store said they get stuck in loop some times and a factory reset with reload of IOS is the only fix. 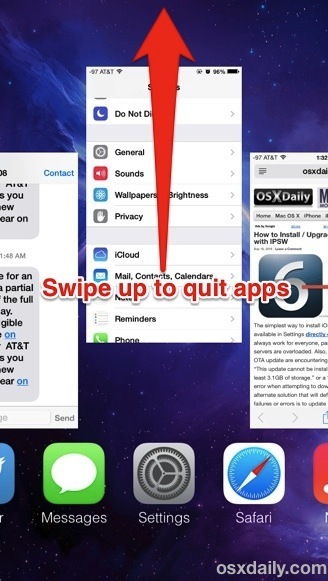 Tried that and that didn’t work for long, so I firmly believe this is an issue with IOS 7.0.4 & 7.0.6. If you check the usage under general settings, both standby and usage are the same which means the phone is on all the time, even when the screen has auto-locked. Battery Doctor also shows CPU at 100% under the more/system menu. Today, my phone was fine for 2 hours, then after using a couple of App’s it went in to battery hog mode. In this mode it’s quick to go flat (less than half a day), it takes a long time to charge (and the phone gets very hot) as its using the cpu is at 100% all of the time and is consuming power as well as charging at the same time. This can take 5 hours or more to charge instead of less than 2. Don’t need a pocket warmer, just a functional iPhone/iPad. Never had this problem before upgrading to this latest IOS. Just look at the Apple forums, many have this issue with this version of IOS. I say this is bull! I should not have to disable features that I want to use because Apple can’t roll out an update. How about an update to the update? Getting more like Microsoft but at least they fix it. Just turning off Location Services (completely) on my 4s extends the battery life considerably. Even with all the apps that use GPS quit, I had to disable L.S. to see the benefit. Sorry thing, they’ve buggered it up so bad. It is sure to boost Android sales. Turning on the (Do not disturb) also saves quite a lot of battery life. ….in addition to the basic items the author presents, I have had noticeable success by removing and re-installing the sim-card on occasion. Or just having a new one installed next time you are in your provider’s store buying accessories. A simple tip provided in the past by a phone tech that seems to make a positive difference IMO. no – you won’t lose anything or any settings. Now why the heck have a smart phone that I have to turn every feature off? What sense does that make. I might as well have a flip phone if my smart features are not easily accessible. My iPhone5 is barely 18 months old. This problem only recently started. A real pain. Obviously ios7 is not meant to work with iphone4, yet I’m stuck with it. Apple’s on their last hurrah– many younger users have already moved on. We have too many choices to put up with being extorted into an expensive upgrade of the same product. Most ‘early adopters’ aren’t old enough to recognize corporate manipulation at its best!